It's A Disney World After All: Disney Celebrates the 50th Anniversary of "it's a small world"
Disney Celebrates the 50th Anniversary of "it's a small world"
You might guess from the blog title...but I have a soft spot for the attraction "it's a small world." I love everything about it, yes...even the song, which was leged...wait for it...darily penned by The Sherman Brothers. It's been a favorite since I was a kid. It's one of the few attractions I remembered actually really enjoying while visiting as a child. My favorite scene has always been the Polynesian room. It just makes me so joyful. So, imagine my happiness to learn that the happiest cruise that ever sailed will be celebrating it's 50th Anniversary on April 10 at all the Disney Parks around the globe! That day, hundreds of voices from Disneyland Resort, Walt Disney World, Tokyo Disney Resort, Disneyland Paris, and Hong Kong Disneyland Resort will come together to sing the unforgettable theme song. Unfortunately, I won't be there in person to celebrate, but I've already helped in my own special way. You see, if you visit SmallWorld50.com you can help get the party started! Visitors are able to either record a version of the song and post it, or create your own unique doll to add to the mix. 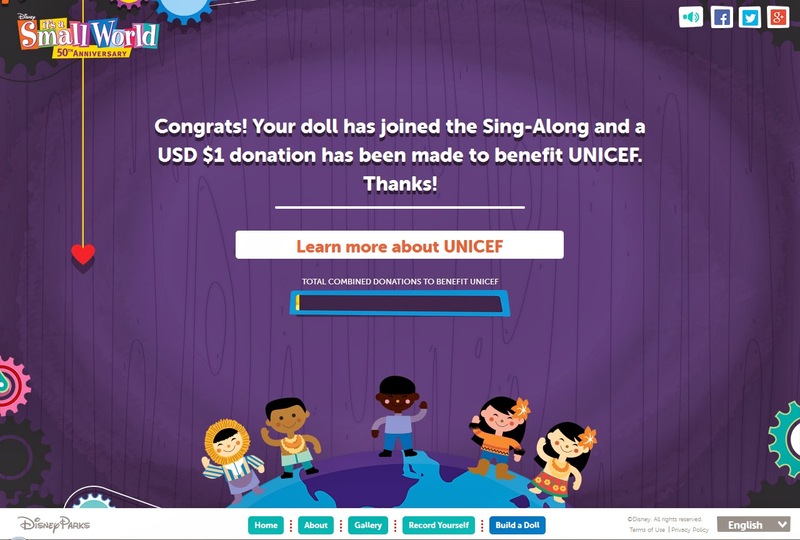 For every doll that joins the sing along or every recorded version uploaded, Disney will donate to UNICEF (the original sponsor of the attraction) $1, up to $100,000. I have already done my part and created a few dolls and plan to create a few more. I hope that you will do your part. It's a wonderful thing that Disney is doing and the attraction deserves a wonderful anniversary celebration! Thanks for all the memories!